The surface of this planet measures 197 million square miles and of that 139 million square miles is covered with water. But wait – that is only one concept of our dimension, a limited anthropomorphic concept. To move with us you must learn to think in terms of space, not distance. For example. The average depths of our nine-tenths of the planetary area is 12, 566 feet; in fact, were the bumpy sections of the land surface of earth – those parts you call mountains – smoothed flat so that the planet became a perfect sphere, the entire surface would be covered with water to a depth of 8,000 feet. Yes, there is that much water! And we are not confined, as you were before this visit, to the thin film of living space that is the dry land. How high have you built, or how deep have you burrowed on the land? A few thousand feet at most! And to use these paltry intrusions into the sky or the land – to live there – you depend on machinery. You are like birds who may climb trees but cannot fly. Our world – our living room, counting all our head room, and side room, room before and room behind, the surfaces above and the depths below – is 331 million cubic miles! Beyond your comprehension, not at all! For lack of an example you place too much value on the imperatives bred in you by the need to fight for a corner of your restrictive surface land. Think instead of the dimensions of outer space – you have dipped an inquisitive paw into your ceiling as we have lifted an inquisitive beak in ours. Is it not the case that confronted with the awesome emptiness of space your territorial imperatives change? There is no enmity among your space men. Well, they, alone of your kind, have tasted the size of our natural habitat. To understand what we are and why we are it is necessary to understand that we have not only been graced with most of the space but that that “most” is beyond exploration. There is no discovering an end to it, for there is no meaningful end to it. There is no need to guard one part of it, for one part is the same as another part. Example. We have been here some thirty million years and we have a facility for what you call memory which allows us to “remember” the elements of that time. Memory is habit ingrained in the mental structure of all beings, and you have noted with some wonder that one of our kind whom you term the pilot whale is given to grounding itself on the land for no known reasons. Only recently have your scientists noted that such groundings take place where once there was no land – where continents have moved and closed old sea passages. Such theories have been labeled nonsense – how could any beast remember a passage closed for twenty million years? The answer, or at least one answer, is that memory is memory, that it is not shed like skin, and we have no knowledge that that passage had been closed. How could we have? When you have 331 million cubic miles to journey in, everything is new. Or more simply, if we were to take one year to explore 30 cubic miles of our world – no man could properly map that size of cubic area in so short a time – we would need ten million years to do the whole. The world moves a great distance in a time span of that magnitude. Which means there is no end to our journeys of exploration, for all would have changed by the time any were even partially completed. And this affects us. The very essence of what we are, although we are aware that you have no great respect for the essence of what we are. We are not serious. We build nothing. Outside of ourselves we create nothing. Our brains expand for no good reason. We have no competitive spirit, or not spirit of the kind that you admire and instill in your young for the advancement of your species. If you were to be presented with our world to live in, all that you area as a species now would die. You would become like us. You would not be joined as tribes, grouped as countries, separated by color, class or creed. All these imperatives stem from the smallness of your world. Let us consider the possibility that one day one of your spacecraft discovers another world, as pleasant and temperate as this. The only difference is that it is bigger, shall we say a million times as large as Earth. If you were to take each of your present nations and place them in separate parts of this giant world, and to each of the units of these nations offer total freedom of expansion, what would happen? Think before you answer, and consider the size we have mentioned. Between Africa and the United States the distance would be 6 billion miles; twice that between the U.S. And Asia, and these continents would have land areas equally enlarged. We think if you were to ever discover such a world it would be a honeypot trap for your species. It would puff out the frantic energies and claustrophobia that presently impel you. We have never been so impelled; that is the essence of the difference between us. Before taking this tour you were briefed on the some of the aspects of us now established by your scientists. None of these findings has done a great deal to improve out status – we are still not serious, have built nothing and outside of ourselves have created nothing. And yet it is accepted that our brains have expanded to a larger size than yours. How can you resolve the paradox? Working only on the evidence in your possession, and we would stress that it is limited, it is surely possible to see something of our world through our eyes. Let us begin with our body shape. Our bodies are our buildings and our art. We have no criticism of our world. It is boundless, eternal, multifaceted, changing. But our original bodies were poor vehicles in which to move through this world. Now they are their own perfection. You will notice you feel no weight, none upon the body and none upon the mind. On the land you are constantly trapped and held and moved by a force you cannot see. Although you are no longer aware that you are in water – what is water? - you can feel the perfection of movement from a perfect hydrodynamic shape. But what is shape? It is not a conscious structure but a device for movement, a device now so well made, so well adjusted to its purpose as to have no conscious effect. These bodies are sculptures expressing freedom, nothing else. Movement – how may we describe movement to walkers? To birds perhaps, but even that comparison is primitive. There is no flapping of wings here. Movement is no more than a minute adjusting of lung breath, the gentle inclination of a fluke or the merest flicker of a tail muscle. We hang in our sky, are suspended in our world, not embattled by it. And remember there are two worlds, worlds of different tactile sensation, a world to float in and another to breathe in. To understand you must imagine that your metabolism is that of the most bizarre alien – a vacuum breather. Think of yourself free of gravity, free to soar through your own sky, brushing mountains, swooping through canyons, playing tag with the clouds and hide-and-seek in the tops of trees – then gliding up and up when the time comes to sip a little of the vacuum outside the atmosphere. We are sorry this is such a fantasy for you. It is the reality for us. When there is a need for excited movement, then of course we can find speed! There are games to be played, the feel of the sea as it breaks up and over our storming tails, the skimming away of the streamlining molecules leaving drag and friction to dance their slow steps on our ghost skins. A roll in the sky, a spin in the air, a ride upon one of the bow waves of your boats, or a quick dash for food – all are games. There is a sophistication in play and the food hunt that perhaps you may never understand until you understand freedom. But when we review the restrictions your world has lain upon you and the restrictions you lay upon yourself it is hard to see how you will ever come to understand this world of ours. And if you cannot understand this world, which is the alpha and omega of our existence, the amalgam of our brains and our bodies, how will you understand us? The movements you see are, in us, sublimely easy. Our evolution, of the brain and of the shape, is a natural function of perfection. There are, we must stress again, no practical limits to this freedom. Certain of our species have made a choice as to where they prefer to swim, but for all there is eternal change, unending room. We may go up or down, as and when we choose. Down as far as the desire takes us, the body closing in on itself, protecting itself from pressure; changing air into blood energy, then up, up (fast or slow as it suits), the body opening again. There are no threats from any of these other creatures in the sea. It is as if they have been put here in our service. Even the great shark, who is forced to swim in his narrow plane of pressure, can be moved on with a good prod from our hard beaks. Everything else exists either to sustain or to delight us. You question why we have produced no works of art but do not question the further paradox that we have brains large enough to appreciate art. Could it be that there is enough beauty here, that the kaleidoscope is varied beyond comparison, that the hues of the sea, of the live scales of fish, of the rocks, sands and sea plants are their own canvas and that you may perhaps be limiting yourself by crediting the status of “artist” only to those who can interpret beauty and emotion to others? Would it not be true that if all your kind could make such interpretations there would be no need for artists? That you would all be artists? An excuse? No, not in our case. But perhaps it would be if all we had to see with, as is almost true of your kind, were eyes. Consider our eyes, our many different “eyes”, and then consider us against any measure you would like to choose – as builders, say, or as artists, or as musicians. For all of these are aspects of things you see and hear. Now consider what we can see and hear. With our eyes we can see more than you – with our optical eyes, that is. We may see from beneath the sea; the beaten pewter of the surface, the black holes of the thermoclines, the shifting rays of an inquisitive sun, the dancing tricks of refraction, the gently shifting deserts of sea bed, coral fantasies (busy builders these!) ranging across the architectural spectrum, carapaced thing, angel fish and devil fish, jellies and living rocks, undersea mountains painted with rainbow encrustations. Yet with a blink, and a small adjustment of our optical eye muscles, we can see all that you can see. We may peer through the spume of storms, view sunsets and moonlight, dawns, and cyclones; the towers you build along the edge of the world, the heaving buckets you float across our ceiling, the dark, clumsy blobs, windowless (and we have assumed mindless in terms of their enjoyment of the sea), that you have lowered below the ceiling and that you call submarines. And we have seen you, and wondered. Oh how have we wondered! We wonder how you live, where you live, but most of all why you live. Do you ever really play? But we must stress that these optical eyes, in spite of all they (in our terms ) can see, are not rated particularly highly by us. There is even one of our kind that bothers with not at all. No, our true eyes are what you would call our ears, with some special connections and receiving equipment that as yet you do not possess. We may see a mirror view of converted sound, a view with depth, that sees inside and outside, around and about, measures and counts – with these eyes we may take a total count of all there is to be known within the ever-expanding balloon of the sonar mirror. 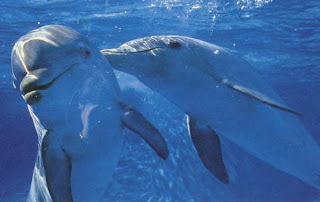 For example, friend dolphin swimming there – even if the were to remain silent, which, as you can hear, he is not – need tell me nothing. I know he is 100 feet away, swimming at 3 feet per second – see now he has just changed course, and is following the butterfish. I cannot read his mind as such, but I can calculate his thoughts simply by looking. You question that? His stomach is full and his lungs expanding and contracting under no great strain – so he has no need of the butterfish for food. In any event I can judge the speed of the butterfish and have “seen” that the rock it is now approaching has a large hole inside it; too small for friend dolphin. Now see, he spurts, it is a game. A boring game, I admit, for he can make the same calculations as can I. He can see the hole, judge the speed of the butterfish – it is just a moment's exercise. Please believe that this example is trivial. To read all physical knowledge in a single sonar glance and to refresh that knowledge constantly with echo pulses, to know of the insides of things as well as the images presented by the outside, to be able to do all this by processes of millionths of seconds, is to have a comprehension beyond any example we can present for your kind. We are beyond conception in your sense, and I do not mean that in a derogatory way. All these processes, all this reading, all this seeing, are not taking place consciously. It is not like one of your radar operators sitting in front of a machine gathering special knowledge of a particular set of events for a specific purpose. We incorporate this special sense of seeing into our special state of normality. And this is true of our sound communications as well. In the sense that you have need of sounds, we have no need at all. Patronizing? No, objective. Consider friend dolphin again. I know everything he knows – his chances of success, his physical imperatives. I can assess his chances of success. All this from a few clicks. What need of sounds that transmit information – what you call the spoken word – in that case? The only “voice” communication I need to make is one of appreciation – or scorn, or humour – all emotive sounds, all emotions that can be expressed other than by sound. Even your kind have developed gestures of the hands, expressions of the mouth, frowns, smiles, or at best a whistle of appreciation or a groan of contempt. To express an emotional reaction you need no sound, and we need them even less. If that were the only purpose of communication we would be completely silent animals. We are in fact very noisy. You must ask yourself why. No, you lack our ability to see enough in other ways to appreciate why you communicate as you do, by complex language. I will tell you why we communicate noisily. The primary purpose of communication is contact, an extension of the gregarious instinct we both share. You confuse it with other things because you are obliged, with your limitations, to use communication for other, more basic, tasks. You pass essential information by sound and presume that it is the only way of passing essential information. You exchange images by sound and assume it is the only way of exchanging images. But strip yourself for a moment of these needs. Conceive of a race of humankind that knows all there is to know of its physical universe, that has books enough to answer all the questions, computers so complex as to do all the equations and pictures upon its walls capable of every form of interpretation. Would humankind then cease to converse? It would not. We are gregarious animals. Here this gregarious need is serviced by sound images so complex as to require that you amalgamate all your media to understand them. I will click ninety times in a second, and each click will be a ball of information that is comprehensive, subtle, definitive, humorous; tinged with warning; warmed by emotional overtones; even a little aggression; and in the light of my sexual nature, of which you are aware, rich with innuendo. Don't look puzzled, I am merely describing a concept of language which many of your experts have described. Bernard Shaw spent much of his life attacking the limitations of your English language and proposing alternatives. Do you seriously propose humankind as a species that should be admired for its communicating ability when in this day and age there are possibly a thousand different languages and dialects? Or more to the point, in a world which admires its ability to communicate, and sees it as the factor which separates humankind from all other species, including ourselves, there is not one human being who can communicate with all other human beings. You have had great difficulties communicating with us. This has always been somewhat surprising in that, so far as we know, there has never been an instance where we have been anything other than interested in or desirous of communication. In recent years we have become aware of the limitations of your vocal structure. Here, as you know, we use twice the sound spectrum that your limited auditory system can receive. I think we must both accept that until you have built equipment to compensate for these inadequacies, vocal communication will be very difficult. We could of course learn some of your limited sounds, and we will do our best. But the imperative, surely, must be on your side. We have lived by a code which allows an adaptation to new requirements, not a change of structures to them. Given time, a few million years, and a continuing human interest, no doubt we will adapt ourselves to speak within your sound ranges. If you want it any sooner, and I would again remind you that the limitations are on your side, you will have to supply yourself with another tool. It would be better surely if you changed yourself in the fullness of time to use our range, but we sense, as it would appear to be the nature of your species, that you will seek something more immediate even though it will not be as comprehensive. As for the brain, well, we know nothing of the brain. It is an extension of all else. The brains we have are the brains we need. The brains you have are the brains you need. We know something of your evolution on the land. Down the ages we have met your kind at different moments of its development. Again, this is not a criticism. There were no tigers in the sea. We were not so badly buffeted by Permian winds nor driven so close to extinction by the ice ages. No dinosaurs walked the bed of the sea. The sea has been our womb since we first chose it for what if offered. It was kinder then and it has been kinder since. So we understand the drives that have shaped your kind. But you must understand that we are shaped by our world too. There is no danger here, so there is no fear. There is no hunger, so there is no justification for killing other than for the essential food requirement. There are no territorial limitations, so there are no territorial imperatives. There is no need for work, so motive comes from play. That we are gentle, forgiving, undemanding, inquisitive is not that we are special, it is simply the shape of our surroundings. You say we have large brains. I say we have normal brains. No, that is not to say that you have small brains. For your kind you have normal brains. Why do we bother with you? We bother because evolution has no end. You are obsessed with “difference”, determined that there should be a gulf. There is no longer any need. You have stopped building moats around your castles. You have even reached the point where you have a secret longing for communication with another species. Are your space probes looking for rock samples or life samples? Is this obsession with UFO's anything more than a rejection of cosmic loneliness? As I have said before, we are gregarious, and as you know well, we share a common evolutionary heritage. We are the same at heart, you of the land and we of the sea. You will find your life on other planets when you have the technology to get there – the laws of logic and the size of the galaxy make that inevitable. The same goes for us. You will find us when you have the mental technology to recognize our existence, and if this visit, be it ethereal, is any guide, we are getting very close. In the meantime, learn what you can of us, as we are interested to learn of you.